This is absolutely amazing because it really initiates a new level of interaction between engineering design tools and Google Earth. If you think Google Earth is neat, you really need to see Google Earth augmented with Civil3D data. 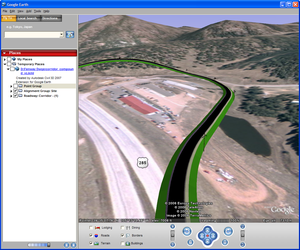 Autodesk has just announced the Civil 3D 2007 Extension for Google Earth—Technology Preview. This is a publishing utility that is designed to publish Civil 3D objects and design data in Google Earth. This means that you can publish not just points, but more complex objects such as parcels, alignments, corridor models, surfaces and hydraulic networks. 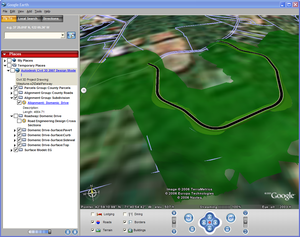 The utility creates a KML file that can be opened directly in Google Earth. By simply providing an URL to the KML file you can allow others to view and navigate your design data in Google Earth. Secondly, inside Google Earth, you and others can add layers of data, including buildings, transportation systems and other data to build geospatial context. You can also include such visualization capabilities as realistic “drive-throughs” along road centerlines and snapshots of locations and you can associate design points with 3D objects, such as light poles, houses and cars along a street . Some public samples have been posted at www.landxml.org/schema/UserSamples/UserTransformSamples.htm. I am an instructor at ITT Tech in Tempe AZ. I am looking for some data to use with the Map 3D portion of Civil 3D 2008. This data would be used to demonstrate some GIS concepts. Could you provide any links and/or information which would lead me in the right direction? Thank you for your time.